It’s starting to ramp up to comfort food season. Not like that has stopped me year round to make most any type of comfort food, but this fall season in particular has already yielded a variety of soups and casseroles. This is one of those recipes. While thinking of a warm recipe for a cool day, I thought of what my wife and kids would eat, and eat well. Nachos! 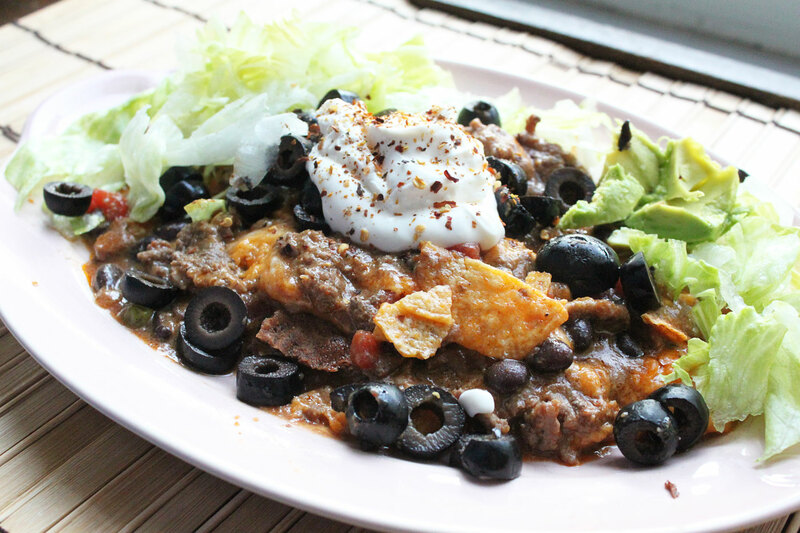 But how could I turn a simple, or complex plate of nachos into something warm and comforting? I looked around to check on my inventory, and granted I was looking at pie dough and thinking of chicken pot pie, a thought I had to quickly shake out of my mind, and then again back to the nacho thought. How about a riff on chicken pot pie but go nacho style? How about a nacho pot pie?! Nacho pot pie it was, and not only super easy to throw together, but everything you love about nachos in a luxurious pot pie style, sans the pie crust. Granted this is not the prettiest of all dishes, but again what pot pie is when you plate it? This is forkalicious delicious. Think nachos. Think pie. Good, let’s go. Get a large skillet on your burner over medium-high heat. Add the ground meat and cook until browned. Drain any fat, and then add the taco seasoning, green chilies, onion, garlic, and 1/3 cup of water. Give a good stir, and cook until the onions are softened, about 5-7 minutes. Place the meat mixture into a casserole dish and return the skillet to the heat. Add the butter and let it completely melt. Once melted, add the flour and stir (and keep stirring) until all of the flour is incorporated. Cook this through for a few minutes. Slowy stir in the milk, and use a whisk if you want to ensure that the mixture gets nice and smooth. No clumps needed here. Once smooth, add in the remaining water or stock, and stir again. Season with salt and pepper, and let the mixture come to a boil, stirring frequently. The goal here is to make a thicker sauce. Once the sauce thickens, add in the black beans, and return the meat back into the skillet. Stir well and cook for another 5-7 minutes. Add shredded cheese to the top, then crumble a generous amount of tortilla chips over the top. Place the skillet (if it is oven safe, otherwise put everything in the skillet before adding the cheese and chips) into the oven and bake for about 15-20 minutes. Scoop out your desired amount onto your plate and top with your favorite toppings. In my case it was black olives, shredded lettuce, avocado slices, sour cream, and hot sauce. Feel free to have a bowl of chips on standby for any additional scooping! The result is spectacular. 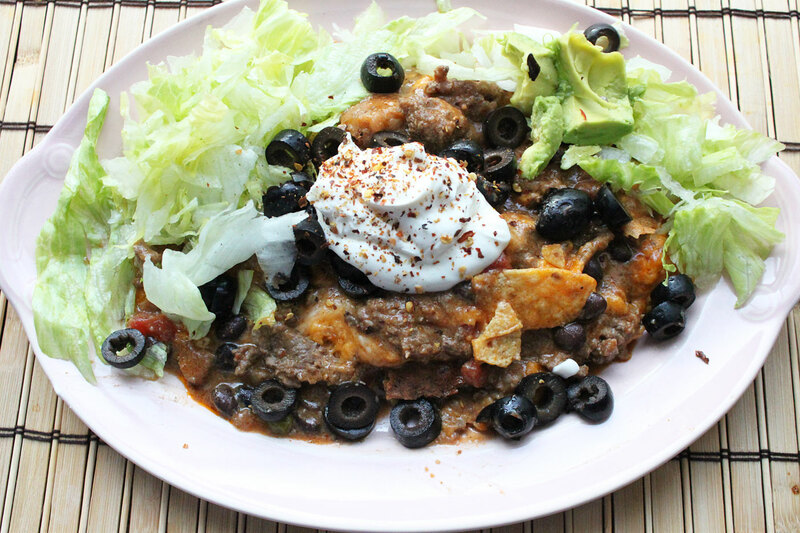 It is so comforting and everything we loved about a pie or a plate of nachos, all bundled together! Hope you enjoy!